Motorists travel along Interstate 275 near its southern terminus with Interstate 75 in Manatee County, as seen from the 36th Avenue East (Ellenton-Gillette Road) overpass. Photo taken February 12, 2015. 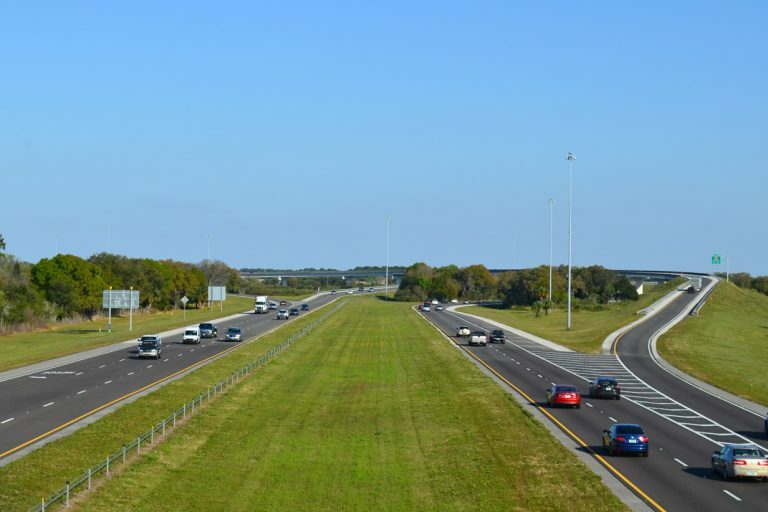 Interstate 275 is the primary urban freeway serving the Tampa-St. Petersburg metropolitan area, spanning a distance of 60.6 miles from I-75 in north Manatee County through St. Petersburg and Tampa via the Sunshine Skyway and Howard Frankland bridges. The northern apex with I-75 lies at the Hillsborough / Pasco County line between Lutz and Wesley Chapel. 1960 to 1964 - St. Petersburg northeast across the Howard Frankland Bridge to Downtown Tampa - opened as Interstate 4. 1964 to 1967 - Downtown Tampa north to Pasco County - opened as Interstate 75. 1965 - Downtown interchange area - opened as Interstate 4 to the east and west and Interstate 75 heading north. This numbering configuration lasted until May 14, 1971, when Interstate 4 was truncated and replaced by Interstate 75 from the Downtown Interchange west and south into St. Petersburg. However, the I-75 designation would only last until August 24, 1973, as it was moved onto the then proposed Tampa eastern bypass (originally I-75E) and replaced by Interstate 275. The remainder of Interstate 275 through St. Petersburg to Interstate 75 near Ellenton was completed in stages between 1978 and 1987. During this time period the freeway was extended south from Downtown St. Petersburg to U.S. 19 south near the north Skyway toll plaza and from Interstate 75 in Manatee County to U.S. 19 north near the south Skyway toll plaza. Those sections of freeway were opened to traffic by 1985. The remaining piece of Interstate 275 though would not open until April 30, 1987 when the current Sunshine Skyway bridge opened to traffic. The new cable-stayed structure replaced the original cantilever spans across Tampa Bay, one of which (the southbound span) was severely damaged in a freighter accident in May 1980. The Sunshine Skyway is a cable-stayed bridge that carries Interstate 275 & U.S. 19 across the mouth of Tampa Bay, connecting Palmetto with St. Petersburg. For more information on this famous crossing, please see the Sunshine Skyway Bridge guide. Constructed in the late 1950s and opened in January 1960, the Howard Frankland Bridge became the third crossing over Old Tampa Bay to link Hillsborough and Pinellas counties. Named after the businessman who lobbied for its construction, the Howard Frankland was built as a part of Interstate 4 and carried four lanes of traffic (two each direction) separated by a barrier. As traffic demands steadily increased in the 1970s and 1980s, a second span was built parallel to the original span, and opened to traffic in 1990. The new span carried southbound traffic while the 1960 crossing was rehabilitated to accommodate northbound traffic. Today the Howard Frankland bridge carries eight overall lanes (four on each span) over Old Tampa Bay, providing a necessary link between the St. Petersburg and Tampa areas. A Project Development and Environment (PD&E) study preceded work anticipated for 2020-24 to construct a new span to replace the 1960 bridge and upgrade the 1990 crossing with provisions for a regional transit corridor. Shield assemblies for Interstate 275 and U.S. 19 stand at the north exit of the south Skyway rest area. Heading toward I-275 & U.S. 19 south also takes drivers to the entrance to the South Skyway Fishing Pier. A right turn will default motorists onto Interstate 275 & U.S. 19 north across the Sunshine Skyway. Photo taken 07/10/11. SR 688 (Ulmerton Road) concludes at I-275 east of Feather Sound in St. Petersburg. Two lanes default onto I-275 north to the Howard Frankland Bridge and Hillsborough County while a single lane leaves for southbound I-275 to Downtown St. Petersburg and Bradenton. A slip ramp also links with Dr. Martin Luther King, Jr. Street N (CR 803) south. Photo taken 07/06/13. 26th Avenue South at the on-ramp to Interstate 275 south. The freeway continues southward from this half diamond interchange toward the Sunshine Skyway bridge and the Bradenton area. Photo taken 08/24/13. Departing Interstate 275 northbound via the off-ramp (Exit 20) to 31st Street South. This ramp was intended to connect with the northbound beginning of the St. Petersburg-Clearwater Expressway. Photo taken 03/25/07. Ramps prematurely curve and end at 31st Street North just north of the Interstate 275 overpasses. Photos taken 03/25/07. The ramp at Exit 21 ties into 31st Street S adjacent to Interstate 275. The St. Petersburg-Clearwater Expressway was proposed northwest from the wye interchange here to the exchange joining U.S. 19 Alternate and SR 666 at Bay Pines. Photo taken 03/25/07. Traveling south along the 31st Street S on-ramp to the inside lanes of Interstate 275. Photo taken 10/15/07. A two lane ramp merges onto the left side of Interstate 275 from the planned St. Petersburg-Clearwater Expressway. The freeway was planned in the 1970s as a 20.2-mile Interstate grade highway. Cancellation of the highway occurred on May 12, 1978 because the new Interstate was more than 10 miles in length. A federal rule instituted at that time indicated that any new Interstate consist of a "final link" in the Interstate system, rather than a new wholesale facility. Photo taken 10/15/07. An original Interstate 75 shield was posted at Grace Street west at Dale Mabry Highway, just south of the U.S. 92 interchange with I-275, until 2008. The "275" overlay had faded to reveal "75" over the course of three decades. Photo taken 04/02/06. Second photo taken 05/11/07. An overhead was posted just north of Grace Street for the northbound on-ramp for I-275 to the Downtown Interchange with I-4. It was removed during work to upgrade the freeway. Photo taken 04/02/06. Bird Street expands into a four-lane boulevard as it connects U.S. 41 (Nebraska Avenue) and U.S. 41 (Florida Avenue) with Interstate 275 south at Seminole and Lamar Avenues. Photo taken 01/18/14. Lamar Avenue forms a northbound service road from the I-275 northbound off-ramp to Bird Street for Waters Avenue. The shield for I-275 south was askew and faced perpendicular to Bird Street westbound. Photo taken 01/18/14. 04/02/06 by AARoads and Justin Cozart.